Seabreeze Industries is the industry leader in service and support for boat owners and manufacturers around Australia. We pride ourselves on being the partner of choice for Australia's leading boat builders, and this reputation has been forged through many years of meeting and exceeding our clients' expectations. We know the importance of getting what you want when you need it. This means quicker products and faster results for you. This is to follow through with our high level of Customer service, and we at Seabreeze Industries believe that the key is "Service". All prices listed at Seabreezeindustries.com.au are in Australian dollars and include 10% G.S.T. Please be aware we do not ship internationally and cannot accept International Orders. All orders will be shipped once payment has been approved. Orders will be processed and despatched within 72 hours of receipt during business working days, Monday to Friday. All orders will be sent via Courier of our choice to a residential or business address only. Please be aware we are unable to deliver to PO Boxes. We shall email you within 72hours (during Monday to Friday) to confirm processing and despatch of your order, along with the tracking number of your delivery. We deliver products Australia wide via our nominated Courier's. The services available and used for your order will depend on the destination, size, weight and delivery time frame. Goods are despatched from our QLD Warehouse and generally deliveries to Brisbane, Sydney and most major towns and cities in N.S.W and QLD will be delivered within 2-10 working days. Please understand Far North Queensland, Northern Territory, Western Australia, Tasmania and other remote areas may take longer. Please note for public holidays the delivery will increase, as timeframes indicated are business working days (Monday to Friday). Please note that someone is required to be at the nominated delivery address to sign for the delivery of the goods. Deliveries will take place between 8am to 5pm Monday to Friday. Please understand the Courier Company cannot telephone prior to delivery of goods. Should you not be in attendance at the nominated delivery address a calling card will be left, advising of the attempted delivery. You are then able to contact the number provided to arrange a suitable time and date for delivery that suits you. It is your obligation to enter the correct delivery address details at the time of ordering. Should you enter the wrong address, we are not obliged to re-send the order to the correct address at our expense. Should you be at work during the week, please consider the delivery of goods to you at your place of work. We suggest detailing your name and C/- your business address. It is the responsibility of the customer to inform Seabreeze Industries if an order does not arrive. Once we learn an order has not arrived, we will lodge enquiries with the courier to ensure delivery occurs as soon as possible. Please note that if an item has been lost in transit, we will not despatch a replacement item immediately. Replacement items will be despatched according to our discretion. Please choose carefully. We do not normally give refunds if you simply change your mind or make a wrong selection. Seabreeze Industries will only accept an exchange if the product is delivered damaged. If an item is delivered damaged, please contact us directly on 07-5546-2804 within 48hours to advise us of damaged goods. Please also note damage on consignment note provided by the Courier for receipt of goods prior to signing acceptance of delivery. Late delivery does not constitute a failure of our agreement, and does not entitle you to cancellation of an order. All products offered by Seabreeze Industries are covered under various warranty proceedures. Refer to each individual product or contact us for more information. Service agents all around Australia will be available to repair the product within the warranty period. Each manufacturer has the right to replace or repair the product at its discretion. The warranty period is detailed in the specific product information for each product. At Seabreeze Industries we understand your right to Privacy and the importance of keeping your personal information secure. We would like to assure you that shopping online with us is completely safe. Our website uses the eMatters Payment Gateway for all online credit card transactions. All information is secured using the industry standard Secure Socket Layer (SSL) technology which means that all your credit card and personal details are encrypted when transmitted over the Internet. If you are concerned about providing your details online please send us an e-mail or telephone 07-5546-2804 to place your order. All information given to us will only be used to enhance your shopping experience, resulting in a more personalised service for you. We are fully committed to protecting your privacy. Any personal information that you submit will be used simply to process your orders. We are not involved in the selling, trading or alternative unauthorised use of personal information. We ensure that we will not pass on your personal details to any other organisation. Generally unless otherwise noted on our items, our products are always in stock and are available at the time of purchase. Because Seabreeze Industries are active sellers elsewhere, stock levels can change at any point in time. For pick up orders it is always best to contact our office to make sure the stock is available for when you are likely to pick up. In the event that we run out of stock of your item, your order will automatically be placed on back order and dispatched when goods arrive into stock. You will be notified as soon as possible regarding the estimated dispatch date of your order. At that time you can choose to cancel, exchange or wait for these items to arrive back into stock. We will ensure to always offer our customers a high level of service. 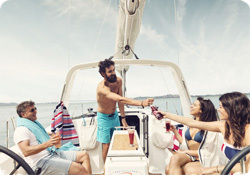 With a national network of highly experienced marine service technicians, Seabreeze Industries is the industry leader in service and support for boat owners and manufacturers around Australia. We pride ourselves on being the partner of choice for Australia's leading boat builders, and this reputation has been forged through many years of meeting and exceeding our clients' expectations. Call us today to experience how Seabreeze Industries can help you.